Liberal takes game one of their weekend series with the El Dorado Broncos 10-8 Friday night at Brent Gould Field in Liberal. 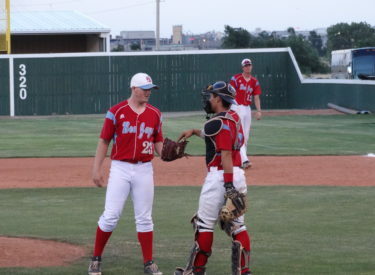 The Bee Jays scored seven runs in the last two innings for the win. The BJ’s scored two in the first. Clint Allen doubled and Blake Brewster doubled him home. Brett Vosik singled and Brewster scored on an error for the 2-0 lead. El Dorado scored in the second with a homer to left. Lichty scored on a Dylan Paul sac fly to center in the third to make it 3-1. That lead stood until the Broncos scored three in the seventh for a 4-3 lead. The Bee Jays scored five in the seventh. Daniel Abiles and Channy Ortiz singled to begin the inning. Lichty bounced a single to center to score two and make it 5-4 BJ’s. Dylan Paul rifled a two RBI triple to right center to make the score 7-4. Vosik singled him home for an 8-4 lead. El Dorado scored three in the eighth to trim the lead to 8-7. Chase Hacker tripled to begin the eighth and scored on an Allen sac fly. Ortiz scored on a wild pitch. Vosik, Lichty, and Ortiz had two hits a piece. David Moffat pitched four innings allowing one run. Josh Zanger went three innings allowing three runs. Christian Isenhour pitched 1 and 1/3 allowing four runs. Anders Davidson came on for the save going 2/3 with two strikeouts. The hits were even at 11 a piece in the game. The Broncos had two errors and the BJ’s had one. Liberal is 8-5 overall and 6-4 in the Jayhawk. El Dorado is 3-5 in the Jayhawk. Liberal hosts El Dorado Saturday night at 7 at Brent Gould Field. Southern Pioneer Electric is the buyout sponsor and will give away BJ hats. It is Kids Night and Liberal Recreation baseball players will run the bases during the game and are asked to be at the game by 7. The BJ free youth clinic is Saturday moring 10-12 at Brent Gould Field. Tonight’s game airs on 1270 and kscbnews.net with pre-game at 6:45.